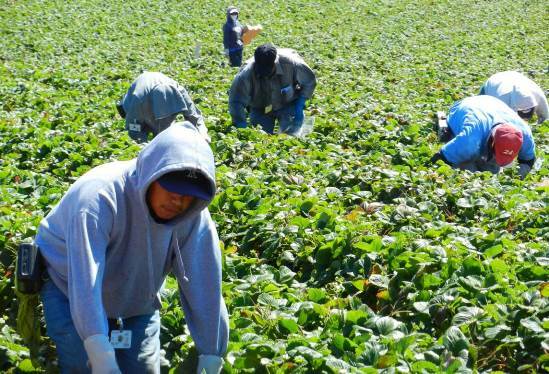 Are migrant farm workers disappearing? 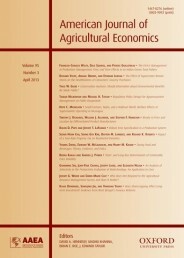 The American Journal of Agricultural Economics provides a forum for creative and scholarly work on the economics of agriculture and food, natural resources and the environment, and rural and community development throughout the world. Migrant farmworkers plant and pick most of the fruits and vegetables that you eat. Seasonal crop farmers, who employ workers only a few weeks of the year, rely on workers who migrate from one job to another. However, farmers’ ability to rely on migrants to fill their seasonal labor needs is in danger. From 1989 through 1998, roughly half of all seasonal crop farmworkers migrated — traveled at least 75 miles for a US job. Since then, the share of workers who migrate has dropped by more than in half, hitting 18% in 2012. Because of this drop in the number of migrants, farmers are increasingly struggling to find workers to pick their crops before they spoil. Graph by Jeffrey M. Perloff. Used with permission. (1) Governmental and economic changes in the United States and Mexico made immigration less attractive. (2) Demographic changes made farm workers less willing to migrate. Governmental and economic changes reduced the number of undocumented immigrants from Mexico. After 9/11, new laws and greater enforcement increased the difficulty for undocumented workers to cross the border. Undocumented workers who were already in the United States became more fearful of moving for work because of new federal, state, and local laws and increased resources for local immigration enforcement to apprehend them. In addition, Mexicans are less likely to want to work in US agriculture than in the past due to a falling birth rate, an improving economy, and increased social welfare programs. Migrant farm workers. Image by Jeffrey M. Perloff. Used with permission. Migrants have different characteristics than non-migrants. For example, since 1999, 55% of migrant agricultural workers, but only 40% of non-migrants are undocumented. A non-migrant is roughly twice as like as a migrants to be female (27% versus 15%) or speak English (40% versus 20%). Migrants are younger than non-migrants. Migrants are less likely than non-migrants to speak English, live with their family in the United States, or have a US home. In the 2000s, in large part due to the governmental and economic changes, the composition of the hired agricultural work force has changed. Among other changes, these workers are now older, wealthier, more likely to be female, and more likely to live with their families in a US home. Because of these and other demographic changes, a smaller share is willing to migrate than in the past. According to our statistical analysis, one-third of the reduction in migration rates was due to demographic changes, while the remaining two-thirds was the result of governmental and economic changes. Farmers have responded to the reduction of migrants in several ways, they have changed cropping patterns, worked harder to retain workers, made jobs more attractive to female workers, adopted labor-saving technologies, and increasingly turned to guest worker programs. During this time, the number of agricultural guest workers more than doubled from 20,192 in 1998, to 44,847 in 2009, and almost doubled again to 85,248 in 2012. Because migrants play a crucial role in many labor-intensive, seasonal, agricultural crops, the dramatic decrease in migration rates significantly reduced the ability of agricultural labor market to respond to seasonal shifts in demand during the year. If the current downward trend of migration continues and no alternative supply (such as from a revised H-2A program or earned legalization program) becomes available, farmers will probably experience greater difficulty finding workers during planting and harvesting seasons. Featured image credit: Agricultural work, by catkin. Public domain via Pixabay. Maoyong Fan is an Associate Professor of Economics at Ball State University. Susan Gabbard is a Vice President of JBS International, CA. Anita Alves Pena is an Associate Professor of Economics at Colorado State University. Jeffrey M. Perloff is a Professor of Agricultural Economics at the University of California, Berkeley. 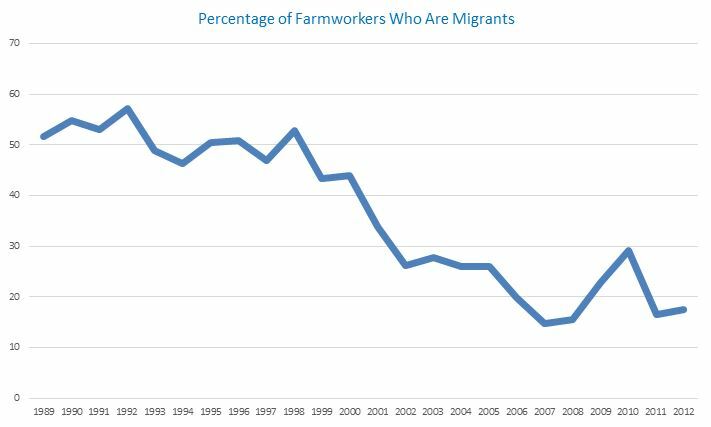 This blog is based on their article “Why Do Fewer Agricultural Workers Migrate Now?” which is forthcoming in the American Journal of Agricultural Economics.